Reliable WiFi is like a good friend to a frequent traveler. It lets you look-up the best destinations and activities, and share your adventure real time. It’s also helpful for mobile access to work. That’s why we think the best way to get connected to the web as you travel is by having a good travel router with you. If you’re checked-in somewhere with unreliable wireless internet, you don’t need to feel helpless. That’s because with a travel router on hand you can have better connection wherever you go. It gives your mobile devices and laptop the connection you need. Plus, instead of having to share public WiFi with others, you get a secured internet connection. 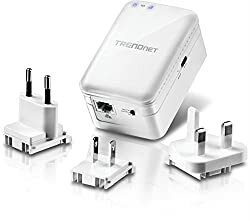 On top of a secure internet connection, travel routers provide extra storage too. With that, you can enjoy sharing files and streaming music to your devices as you please. As a multimedia player, it can read media from an SD card or external hard drive (with up to 4T in capacity). Then as a wireless router, it converts an internet connection via Ethernet Cable or WiFi and broadcasts its signal wirelessly. Finally, it has a built-in 6000mAh battery that can serve as a power bank to charge other mobile devices. 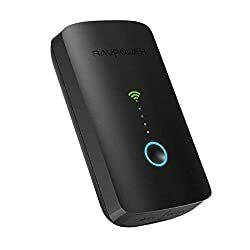 You can use the RAVPower as a personalized wireless router by connecting it to your hotel-provided internet connection. Once on, it has the ability to convert a wired connection into a wireless connection. However, it provides extended wireless connectivity with extra security. Therefore, you get a secure connection for your mobile devices (including Chromecast) when streaming or sharing photos and videos. Moreover, this router supports PPPoE, dynamic IP and static IP signals supporting any connection type. This means you can keep connections with any hotel, Airbnb property, or other travel stops. Some feel that its web interface isn’t user friendly. May be best to use the app for it. A few of users had problems with keeping connectivity to the WiFi network. You’re getting a device with 3 functions and impressive performance with the RAVPower FileHub. Plus, it’s hard not to like this travel gadget. 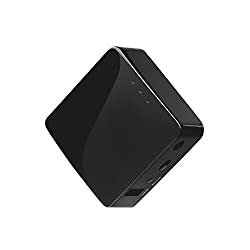 Its multiple functions and connectivity easily make it standout against other travel routers on the market. In addition to its standard features, it also performs well in power and performance, making it our pick for best over-all. As a router, it gives you different connection modes. 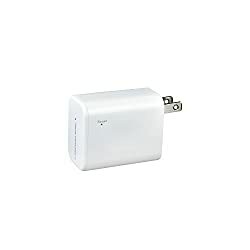 First, it can convert a wired internet connection into WiFi while in AP Mode. You can also create/expand a standard Wi-Fi network to your device while in Bridge mode. Finally, you can use it like a regular router through its Ethernet port. Additionally, this router has the MTK7620 chipset in its design. This supports great speeds as you get connected online. Meanwhile, its other features are pretty impressive too. You get a 4-port USB hub and flash drive slot allowing you to host/transfer files among multiple devices. Plus, when it comes to power, this router doesn’t disappoint at all. With its 10400mAH portable battery, you get enough power to charge up any device for more than twice over. Just as we saw the benefits of a multi-functional router in the RAVPower FileHub Plus, the HooToo delivers the same. The combination of power, connection options and storage is definitely attractive. 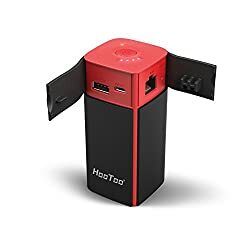 The HooToo only loses a bit to the FileHub when it came to design, connection power, and internet speed. It also supports a standard 802.11n connection vs. the 802.11 BGN by the FileHub. Overall though, it’s not too far behind other travel routers and it’s still a highly recommended buy, making it our runner-up. The Medialink wireless travel router makes it asour favorite low priced, pocket-friendly choice. See, when we say low-priced, you won’t pay more than what you’d pay for a good lunch for two. 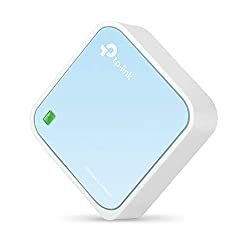 What can this 2-ounce pocket travel router do? Another great thing about this little router is that you can get to the setup in a cinch. You can easily set it up through the router settings interface using your smartphone, tablet, laptop, or computer. No need for an app to manage settings and it’s easy as pie. Some users say they have to sit next to the router to get good signal. A few customers received defective units that broke after a day or two of use. Small but powerful, the pocket-friendly TP-Link N300 gives as much as 300Mbps in WiFi Speed. In addition, you get continuous video streaming and/or online gaming without lagsthrough 2.4GHz band connection. Yet another plus is that the N300 is also compatible with Google Chromecast. The N300 gets you connected through repeater mode, router mode, as well ashotspot, client and AP modes. You can get it powered up through its microUSB port, which can be plugged directly using your charger plug or your laptop. After that, installation is quite intuitive. If you’re looking to share with your travel buddies too, its WISP access point supports multiple users. And they can get connected if they’re in a separate adjacent room. As for portability, the N300 is ultra-light at 7.2 oz. while being small enough to fit your pocket. It’s definitely not a bulky gadget. Some users needed firmware to get it working on Client Mode. A number of users had difficulty setting it up. Unable to work on two connection modes at a time. No extra features for mobile convenience like a powerbank feature. Considering its tiny size, useful features, and not too large price, the TP-Link N300 Nano Travel Router is a good buy. And with its 300Mbps supported speed over a 2.4GHz band connection, it’s easily our pick for Best in Range. You can get the MT300A powered via a 5V DC Adapter or a USB cord plugged into a power bank or a laptop. From there, you can get a secure internet connection wirelessly. 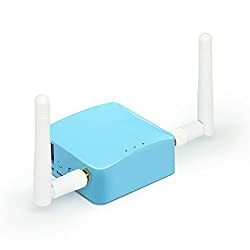 It turns the hotel or office wired network connection into your own private WiFi connection. Plus, you don’t need to pay the hotel an extra fee for connecting multiple devices asthe device itself supports multiple devices. Why the best in security? Well, the MT300A provides an added level of security through 20+ VPN providers that can be used for securely masking your connection. That’s on top of open VPN and Tor Client. But it doesn’t end there. This device also ensures privacy in your connection with its downloadable TOR firmware. How’s that for security? Meanwhile, more than just security, you also get a 128MB RAM giving you faster performance Plus, its Onboard storage of up to 16GB that helps in securely transferring or sharing files and multimedia. If secure performance and storage aren’t enough, you also get two Ethernet ports to support multiple connections and a microSD card for file storage and sharing on top of your 16GB. Some customers had troublewith the router shutting down after updating firmware. A number of customers had defective units delivered to them twice. 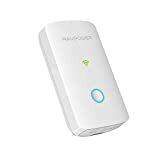 Overall, this router packs a good amount of connection power but at the same time offers the best protection you canget online. But more than that, it also gives you high performance and a huge amount of storage for your files as you travel. Despite that power though its lightweight (less than 1lb), compact, and portable. Plus, it comes with interchangeable plugs compatible with North America, Europe, U.K sockets. Apart from being the fastest travel wireless router, it’s also fast when it comes to setup time. So you can enjoy that great speed and stream video, photos, and music within minutes of setup. Mostly positive reviews, but one customer felt the user interface could be better. Just look at how it provides a faster connection speed than most routers. Plus, since it’s open-source and programmable you can expand it for use from webcams to USB disks. GL.iNet GL-AR300M Mini Travel Router has the speed, functionality, and storage capacity you’ll want in a router, all at a good price. What makes it an even a better fit for the Best in Value label is its open source nature paired with a VPN security feature. Considering all that it offers for the price, it makes a really good buy. The best travel router is one that is pocket-friendly but is at the same time packed with best features. It proves that something small and light can still be packed with speed, power, and great security functions. See, even the most budget-friendly travel router supports a 150Mbps standard connection without disappointing. Now, theRAVPower FileHub Plus comeson top because it’s compact, portable, and has multiple functions. Connection-wise, you can connect 5 wireless devices (and pay your hotel for only one connection) supporting an802.11BGN network. Plus, it has useful features that helpwith everything from storage to charging your devices, even when you’re outside your hotel.